Performers include: Daws Butler, Don Messick, Julie Bennett, Mel Blanc, Vance Colvig, June Foray, Hal Smith, Bill Thompson, Jean Vander Pyl, Jimmy Weldon, and Doug Young. A cartoon creation of the Hanna-Barbera Studios, the character of Yogi Bear first appeared on The Huckleberry Hound Show and then graduated to his own animated series. Eventually, this new show gained more popularity than its predecessor. 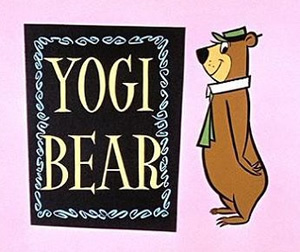 Yogi is often joined in his antics by his best chum, a tiny bow-tied bear named Boo Boo (Don Messick). Boo Boo is a somewhat reluctant helper and often warns his friend that the park ranger “isn’t going to like this.” On constant patrol to stop Yogi’s antics is Ranger Smith (Messick), the park ranger. Other segments included on the show include tales centered around other two other characters. Snagglepuss (Butler) is a smart lion who likes luxary and does his best to evade a hunter named Major Minor (Messick). Yakky Doodle (Jimmy Weldon) is a small and innocent duck. His best friend, Chopper the bulldog (Vance Colvig), protects him from harm, especially from Fibber Fox (Butler). The Yogi Bear Show: Director Eric Brevig and First Pictures of CGI Yogi & Boo-Boo? I LOVE THE YOGI BEAR SHOW.